Danya Malashenkov Industrial, Electro AlDae is the project of Alexander Daemon also of Devilsight. 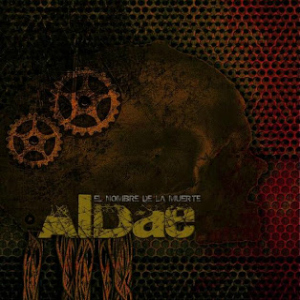 'El Nombre De La Muerte' is an album of 15 tracks, including 10 remixes, an intro, two outro's and an instrumental version of "El Nombre De La Muerte". The "Beautiful Death (intro)" fails to make a much of an impression, but the organ sounds at least match the ghostly noises. However, the same synth sounds seem simplistic and out of place in "El Nombre de la Muerte (feat. Traumatize)". The vocals of Traumatize are okay but wasted on the track. It has it's moments but for the most part, I am back to thinking of my granny playing her harmonium again. We follow with "El Nombre De La Muerte (Code Red Core Remix)", at least Code Red Core seem to have made a little out of it. But not something I can say I want to hear again. In fact it reminds me of the "Popcorn Song" by Hot Butter. After what I thought was a production problem, "Voce Del Morte (Subliminal Code remix - first version)" takes a turn for the worse. Anyone can bang a drum and that is what this sounds like in places, and out of touch with the synths for much of it. It just does nothing for me. There's no real melody or rhythm at all. Again the drums just bang away to no avail in "El Nombre De La Muerte (Destructed by Detuned Destruction)", vocally it's not bad but the rest of it just goes nowhere. The production on "El Nombre De La Muerte (Traumatize Remix)" sounds poor also, it's all over the place. The track "Morphine Sky (Cold Remix By NalruN)" brings a change, in fact a complete contrast. A slow track which contains a multitude of sounds and seems well thought out. It even sounds cold, which is helped as the production on this is also in complete contrast to what has gone before. I am not too into chill music but this is good, it has both melody and rhythm. After a brief respite were back to another remix of the title track "El Nombre De La Muerte (Distorted Face remix)". I have nothing more to say than this is just nasty. I hope Andro-Dioxin can do a little better with "El Nombre De La Muerte (Andro-Dioxin RMX Demon Version)", but despite all the screaming there's not much there. Even the screaming is in fact dire. The outro "Los Huesos Quemados", turns out to be a meaningless but jolly little tune even if it is about burnt bones, and the very unconvincing sniveling just doesn't work. I am now thinking perhaps I should have stopped writing a while ago, but I don't give up so easy. "El Nombre De La Muerte (Purification Mix By Nousia)", includes samples which I can see what the artist was trying to do, but sometimes it just ain't possible. Too much of that original synth sounds left unburied also, which at least others managed to do. So it certainly wasn't purified, just played with a little. Frozen (Antigen remix) feat. Aral brings another contrast, bass and drums make a nice start, but it doesn't last. It has a nice rhythm in places but overall turns into nothing. Still manages to be the second best track I have heard so far. The instrumental version of "El Nombre De La Muerte", give me the Traumatize vocals back please. The samples or whatever they are in this are atrocious. Voce Del Morte (Elektro Grave Remix by Bleeding Corp) brings a little ray of hope with some nicer synth work and some beat, but overall it doesn't quite work. Our second outro is "New Dawn", we hope so! AlDae is the project of Alexander Daemon also of Devilsight. 'El Nombre De La Muerte' is an album of 15 tracks, including 10 remixes, an intro, two outro's and an instrumental version of "El Nombre De La Muerte". You can't make something out of nothing is the best description for the remixes on this album, but not quite true as when I was digging around I managed to find a remix of "Voce Del Morte" by AcrophilicProject that I liked. I am surprised so many known names even tried. The one and only highlight is "Morphine Sky (Cold Remix By NalruN)", which is in complete contrast to the remainder of the album.